The much loved Villa Feliz is situated on its own plot just 50 metres from the sea, with an unbeatable and unobstructed view of the sea. The accessible swimming cove below the villa has shelved rock platforms & steps from which to access the crystal clear waters - great for snorkelling. Shops, Restaurants and the renowned Binibeca beach are all within a 5-10 minute walk. We DO have a Balearic Islands TOURIST LICENCE for Villa Feliz. This is now required by the local government for owners who wish to rent out their properties. Villa Feliz comprises two twin bedrooms with an additional large sofabed and two bathrooms (one en-suite). The kitchen is very well equipped (dishwasher, washing machine, fridge/freezer, hob, oven & microwave). Outside there is a shaded patio, ideal for eating and relaxing. There is plenty of patio area to the front of the property which is ideal for sunbathing with a lovely view over the sea. Villa Feliz has full WiFi internet and Satellite TV (with UK Freeview channels and many Spanish, German , French and Italian channels). The TV has a DVD function and the villa has a games cupboard with many games for the family to enjoy). There is a is a built-in barbecue on the patio for alfesco dining with a stunning view. Villa Feliz does NOT have its own pool or a dedicated communal pool but guests are able to use the pool at a local restaurant for the price of an ice cream or drink/food purchases. Most of our guests, however, enjoy swimming in one of the many see coves or at the beach. Menorca is great for walking in the Spring/early Summer (lovely spring flowers) & Autumn. The recently renovated CAMI DE CAVALLS (Bridleway) is 200 km of lovely walking. You can walk sections at a time using maps available from the local Tourist Offices. Louise & Hugh (September 2016) : We had the most fantastic time imaginable, and a huge thank you for letting us rent your fabulous villa, it was just perfect. There was absolutely everything we needed thank you, even a hair dryer. The WiFi was brilliant so we were very grateful for that as husband had to work a little. There was every gadget etc. possible in the kitchen, even for a caterer like me, it was fabulous. We had such fun swimming and snorkelling in the cove, I couldn’t quite believe that it really is possible to spend 3 weeks without moving very far or doing very much. Sonia Da Rocha : Just a few words to tell you how lovely was our trip in Menorca this summer. The villa was perfect, everything you need, even your own cala (swimming Cove)! Vicky S & Family : The Cove in front of the villas is the best place we have ever swum in – you definitely don’t need a pool when you’ve got the bay ! Sally H & Family : I just wanted to drop you a quick line to say Thank You for the use of your wonderful villa. We had such a lovely time. It is an amazing location, you are very lucky to have it. We would love to visit again next year, are we able to book your villa again? english, french, german, spanish, italian, use Google translate to any language! Hello, I'm Mike. We travel to the villa at all times of the year, particularly enjoying the walking and flowers in April, May and October. Our grown-up children now very much enjoy going on their own, having been lucky enough to go there since they were babies. Our mother bought Villa Feliz many years ago. As youngsters we drove through France to get to Barcelona and on to the ferry to Mahon. Such adventures. We had many happy holidays here as did my parents who went out in May and September every year. Well, the views of course - just the sea in front of you. As a family of swimmers we have always enjoyed the cove below the villa. Villa Feliz has an unbeatable front line position right next to the sea (and, yes, you can hear the waves lapping in the cove and watch the sun going down over the sea). Full WiFi Internet access within the villa. House towels provided but PLEASE BRING YOUR OWN BEACH TOWELS FOR USE ON THE SUN LOUNGERS AND AT THE BEACH. Villa Feliz does NOT have it's own private or communal swimming Pool but guests can use one at a nearby restaurant (for the price of a drink or ice cream etc.). The villa has a retractable awning to provide additional shade over the main part of the frontage (leading out from the kitchen/living area). There is also a covered patio area. WIFI & TV - The villa has a full WiFi connection and Satellite TV providing UK FREEEVIEW Channels (+ some Spanish, French, German and Italian channels). Sheets and House Towels are provided (changed weekly for stays of two weeks or more); you will need to take your own Beach Towels. The Villa is fully insured against major catastrophe but you will need your own travel insurance for the usual things such as theft of belongings, health and accident etc.. WE MAY CONSIDER OTHER ARRIVAL/CHANGEOVER DAYS SUCH AS A SUNDAY. Peacefully relaxing holiday on huge terrace. My wife and I had a wonderful time at Villa Feliz. My wife loved the huge terrace with sea views for her sunbathing. The photos of the terrace don't do it justice. The villa had everything we needed for our holiday. Mike was a particularly helpful host and even answered my questions promptly even while he was on a holiday of his own. Many thanks for your lovely review Steven and Shelley; we love sharing our little bit of paradise with guests from all over the world. We hope that your stay at Villa Feliz was worth all of those airmiles from the USA !! Had a really enjoyable stay in this lovely Villa with it's fantastic view. 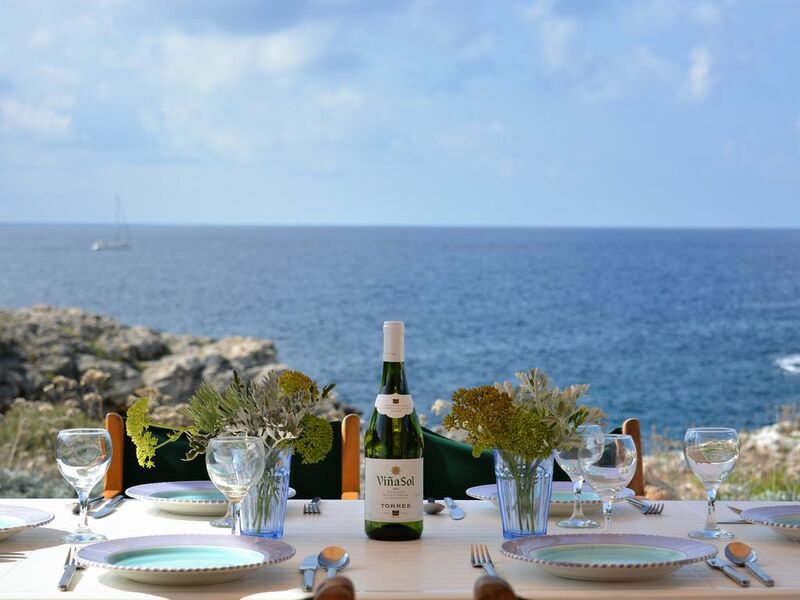 The location is perfect being part of Binibeca Vell and only a short walk to Calla Torret. The villa itself is well equipped. It has a very nice kitchen and lovely seating areas outside. We would not hesitate to return. Lovely Week in Binibeca - No AC though! The location of this property is literally stunning and you can walk down to the cove to either jump in from the rocks or climb down the steps into the water. Be careful of jellyfish as there was a bit of a swarm both at the cove and the nearby Binibeqer beach whilst we were there. Binibeqer beach is possibly one of the best beaches we have been to and the beach bar food was very good. We also hired a car so visited Cuitadella, lighthouse on the north cost and El Toro (highest point on the island) which was nice to get out and feel that you have seen the island a bit. The accommodation itself is well equipped and has everything you need. Large terrace and BBQ which was well used. The only issue is the lack of Air Conditioning - which is declared on the property specification, however it was very warm whilst we were there and we had some sleepless nights as a result. That is the only reason we would not stay here again. As a family of 4, having to walk through one room to get to the living room was not an issue, however i can see why that would not work for two couples. It would appear that the owner is trying to sell the property and we had a minor intrusion into our holiday when trying to go out for the day and an estate agent turned up trying to show someone round. To be told i should have checked my phone when i am on holiday, did irk a little and i think this needs to be resolved or more clearly indicated if this will happen during peoples holiday. We had a nice week as a family and would stay in this area again as i found it much nicer than more built up areas like Son Bou or Cala Galdana, i would just need Air Conditioning though! The house was exactly as we saw in the pictures. Gorgeous view, helpful owners, clean house with all the amenities needed to enjoy Menorca. Easy walks to the store, the sandy beach, and a few restaurants. The cove in front of the house is amazing! We will be back!! Many thanks for your lovely review Jame, we are pleased that you had a nice time. We enjoy sharing our special place with others. That patio, with its view over the sea cove, really is a fabulous place to enjoy during the day and our favourite time is always watching the sun go down over the sea in the evening. We had a very relaxing stay at Villa Fellz.,the villa inside is quite basic but for us a couple in 40’s had everything we needed .For us what makes this villa is the amazing terrace , with the most beautiful views over the sea . It is also a very peaceful and quiet location where you are able to just switch off . There is a lovely little village 10 mins along the road with some nice bars and eatery’s , and a stunning beach 10 mins walk the other way . Only disappointment for me was that there was no access to the cove in front to swim as the steps were nt there to get into the sea .... but ironically on our last day we did see someone fix them down into the rocks !., maybe we were slightly out of season for them .... A great stay in all !!! . Hello Sarah, many thanks for your lovely review. we are pleased that you enjoyed your stay. Do please visit again and don't forget to tell your friends. Thankyou Mike for making everything so easy to book and for your prompt replies to my emails. Thank you Kevin for your lovely review; we always get pleasure from sharing with others our lovely place by the sea. Binibeca (also know as Binibéquer) is situated on the South of the island, just twenty minutes from the beautiful main city of Mahon and the airport. This is a quiet family orientated place, with mainly villas rather than the noisy bar/disco/hotel scene of some other resorts; although there are plenty of restaurants/shops etc. Other Activities: Golf at Son Parc (30 min) and Cricket at S'uestra (15 min). Golf: Golf is available at Son Parc Golf Club which is 30 min drive to the NNW of Mahon near Arenal d'en Castell. CHANGEOVER day for both villas is a FRIDAY. We do NOT charge a Security Deposit - we prefer to trust our guests to look after the villas. SPECIAL RATES AVAILABLE IN MARCH, APRIL, MAY & OCTOBER FOR LONGER TERM PERIODS SUNDAY (OR OTHER) CHANGEOVER DATES SOMETIMES AVAILABLE. We prefer 7 day rentals but may consider shorter periods.